This is the 70th anniversary of the publication of C.S. Lewis’ That Hideous Strength. While it remains an obscure book, it is an important dystopia from the WWII-era. In fact, it dropped the same week as Animal Farm by George Orwell. Over the next couple of weeks I am going to look at Lewis’ That Hideous Strength and Orwell’s 1984. Not everyone knows, but That Hideous Strength is a fictional working out of Lewis’ lecture series The Abolition of Man. This is a challenging book. It took me 2 or 3 times reading it before I started to get a handle on it. I found listening to the audiobook really helped me connect the dots. Recently, the genius behind C.S. Lewis Doodle on youtube has completed a visual interpretation of the first essay in The Abolition of Man. It is called “Men Without Chests,” and I am sure that I am not alone in thinking this is one of the most important essays of the 20th century. I hope you enjoy! This entry was posted in Memorable Quotes, Reflections and tagged 1984, Animal Farm, books, C.S. Lewis, C.S. Lewis Doodle, dystopia, George Orwell, Men Without Chests, That Hideous Strength, The Abolition of Man. Bookmark the permalink. I did not know that That Hideous Strength was a working out of The Abolition of Man, so thanks for that information. I read through the Space Trilogy for the second time last year, and while I quite enjoyed Out of the Silent Planet, with the other two I kind of struggle with understanding (I’m told by my scholarly friends that those two are more complex, so what does that say about me? 😉 ). I think I appreciated Perelandra more the second time, but THS still didn’t strike me like Lewis’ work usually does. I found it somewhat awkward. I need to read The Abolition of Man again and perhaps that will give me more insight. I think Perelandra is like a soak in a super hot tub: it takes a few times testing with the toe, then letting the legs slide in, and finally disappearing. It is a complex book, and I think the best thing to do is to surrender ourselves to the text. We won’t understand all the words, and some of the metaphors slip us by. The romp through the underworld of Perelandra and the ascent to the mountain–echoing Dante–are a struggle. But if we don’t worry about worrying about it, I find it easier. And when you are ready, listen to the audiobook. To me, that clinched it. 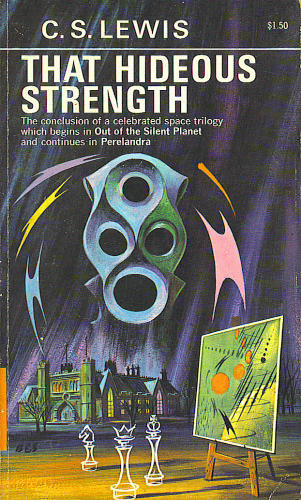 This last time I read That Hideous Strength I read it with George Orwell and Aldous Huxley’s Brave New World. I also read at the same time Jonathan Swift’s Gulliver’s Travels (right after Thomas MOre’s Utopia). I had read some of Williams’ novels, which are weird but usually pretty good reads. With those things, I found this a really rewarding read. The previous time I was reading the Gothic books, and that filled it with other meaning. If you view it as a dark fantasy or dystopia, I think it has its own interest. I’ve just finished a chapter talking about it as Arthurian, which really filled with meaning. Anyway, that’s me. Ransom’s books were my last favourite 5 years ago; now I prefer them to Narnia or the Hobbit.